It is a great joy for me to be here with you today and celebrate this Tri-College Mass with students and professors of the theological communities of the University of St. Michael’s College, Regis College and St. Augustine’s Seminary. I am most grateful to Sr. Anne Anderson, C.S.J., the President of the University of St. Michael’s College, Fr. Mario D’Souza, Dean of the Faculty of Theology, and the Catholic Faculties of Theology for their most gracious invitation. In this celebration, I pay special tribute to the Congregation of St. Basil, the Society of Jesus and the Archdiocese of Toronto for providing privileged places in Canada for the study of Catholic theology through the Faculty of Theology of St. Michael’s College, Regis College and St. Augustine’s Seminary. It is particularly significant to be here in the chapel of the Cardinal Flahiff Basilian Centre at the heart of the Toronto School of Theology for today’s celebration. Only weeks after Pope John Paul II appointed me Apostolic Nuncio to Canada in September 2001, I came here and celebrated my first Mass in Toronto in this very chapel with Fr. Thomas Rosica and his national staff as we prepared for World Youth Day 2002. How many memorable celebrations we held in this sacred place during those unforgettable months thanks to the hospitality of the Basilian Fathers! 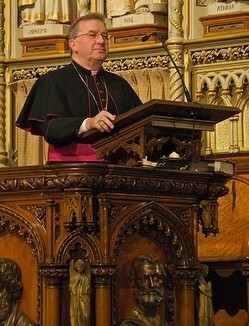 Now eight years later, on the eve of my departure from Canada to take up my new mission as Apostolic Nuncio to France, I come here to give thanks to God for each of you, for the important mission of theology and preparation for ecclesial ministry entrusted to each of you, and for the memories of my episcopal ministry in Canada as representative of the Holy Father to this great nation and Church. It is most fitting that my visit to you takes place on the day when the universal Church commemorates the Most Holy Rosary of the Blessed Virgin Mary. This feast was instituted by Pope St. Pius V in thanksgiving for the great naval victory over the Turks at the battle of Lepanto on this day in the year 1570, a favor due to the recitation of the Rosary. This victory saved Europe from being overrun by the forces of Islam. A second victory gained that year on the Octave of the Assumption determined Pope Clement XI to command the Feast of the Rosary to be celebrated by the universal Church. The Feast is a great festival of thanksgiving for the countless benefits bestowed on Christianity and on our Church through the Rosary of our blessed Mother. Let us reflect for a moment on the biblical readings you have chosen for this celebration today. They reveal much to us about theological preparation for ministry, the role of Mary in the life of the Church, and the authentic needs of the faithful to whom you will be sent to serve. The rich text from the Prophet Zephaniah [3:11-20] speaks of the “daughter of Zion”, the personification of the city of Jerusalem. The Second Vatican Council gave Mary this new title and role in the Dogmatic Constitution on the Church Lumen Gentium #52. As you know from your studies in ecclesiology, Lumen Gentium states that all theology and Marian piety belong to the mystery of Christ and to the mystery of the Church. The Church's appropriation of the title "Daughter of Zion" for Mary has a rich Scriptural foundation. Mary illustrates the prophecies of the Hebrew Scriptures which ascribed value to the eschatological role of woman as mother both of the Messiah and of the new people of God. Mary's role as Daughter of Zion, or for that matter any of her roles in the life of God's people can never be understood independently of Christ and of the Spirit which he bestows upon all humanity in dying on the cross. Mary, “Daughter of Zion” is the archetype of the Church as Bride, Virgin and Mother. Hers is not only biological virginity but spiritual virginity that is fidelity to the Scriptures, openness toward others, virginity and purity in faith. Today we must also consider the flesh-and-blood dimension of Mary, between the old and the new Covenant, for Mary of Nazareth accomplishes the passage from Israel's faith to the Church's faith in the magnificent scene of her Annunciation in today’s Gospel [Luke 1:26-38]. The event of the Annunciation and Mary's life illustrate and recapitulate the structure of the Covenant of the Word of God and the responsorial attitude of faith. They emphasize the personal and Trinitarian nature of faith, which consists in a gift of the person to God who gives himself through revealing himself. The Church of the New Testament begins to exist where the Word made flesh is embraced, cherished and served with full availability and openness to the Holy Spirit. This life of communion with the Word in the Spirit begins with the Angel’s announcement and extends to Mary’s existence. This life includes all the stages of the growth and the mission of the Word made flesh, in particular the eschatological event of the Cross where Mary receives from Jesus himself the announcement of the fullness of her spiritual maternity: “Woman, here is your son” (Jn 19:26). In his opening address to the Synod of Bishops on “The Word of God in the Life and Mission of the Church” exactly one year ago, Quebec’s Cardinal Marc Ouellet said: "A woman, Mary, perfectly accomplishes the divine vocation of humanity by her 'yes' to the Word of Covenant and her mission. Through her divine motherhood and her spiritual motherhood, Mary appears as the permanent model and form for the Church, like the first Church." Now let us come back to today’s feast. In modern times successive popes have urged the faithful to pray the Rosary. It is a form of contemplative prayer, mental and vocal prayer, which brings down God’s blessing on the Church. It is a biblically inspired prayer centered on meditation on the salvific mysteries of Christ in union with Mary, who was so closely associated with her Son in his redeeming activity. The Rosary is Christocentric setting forth the entire life of Jesus Christ, the passion, death, resurrection and glory. Of course, the Rosary honors and contemplates Mary too, and rightly so, for the same reason that the Liturgical Year does likewise: "Because of the mission she received from God, her life is most closely linked with the mysteries of Jesus Christ, and there is no one who has followed in the footsteps of the Incarnate Word more closely and with more merit than she" (Mediator Dei). Meditation on this cycle of Joyful, Sorrowful, Glorious and Luminous Mysteries makes the Rosary not only "a breviary or summary of the Gospel and of Christian life but also a compendium of the Liturgical Year. The Rosary stands revealed as a dynamic teacher and nurturer of Christian faith, morality, and spiritual perfection, fostering in various ways faith, hope, charity, and the other virtues, and mediating special graces, all to the end that we may become more and more like unto Christ. My dear friends, the Word of God has power to touch the lives of ordinary people through solid piety, authentic devotion and attentiveness to the living Word that is not locked in a remote past, enchained by scientific methods, presented in linguistic strangleholds, or covered with archaeological inconsistencies. While the biblical stories we read and contemplate come from a past time, their message is current. Though the stories may be historically inaccurate, their writers were not authoring historiographies but living, theological messages that kept communities of faith alive. Given that archaeology has been so helpful in locating places, unearthing artifacts, confirming details in the text, the science of archaeology deals with dead stones and at times lost civilizations. Never forget that the Word of God deals with the living communities of faith who have handed down the message to us, a message that keeps alive our community of faith. It is to these communities that you will be sent. Never forget that many people whom you will serve do not have the luxury, privilege, money, time or perhaps desire to delve into serious Scripture or theological studies. Their only encounter with the Word of God might be through the liturgy or popular piety and devotion, especially the rosary. For this reason, it is incumbent on those who teach and preach the Word of God to show respect and act humbly when we speak of piety and devotion. Dear Friends, I cannot stand before you today without expressing my deep sorrow and emotion at the tragic events of the last weeks involving one of the bishops in this country. As pastoral ministers and those preparing for ministry in the Church, we are invited to fix our gaze and firmly place our faith in Jesus Christ, the Eternal Shepherd, who alone is the model offered to us as our Way, our Truth and our Life. The Church in Canada bears the wounds together with the victims of a tragic past, and has made and continues to make systematic efforts to prevent the repetition of such abuses and exploitation. The Church in Canada has made every effort to establish safe environments that protect children and young people. Yet we can never underestimate the destructive power of sinfulness and evil that tears apart the fabric of our community. God’s grace will overpower these forces. "If you love Jesus, love the Church! Do not be discouraged by the sins and failings of some of her members. The harm done by some priests and religious to the young and vulnerable fills us all with a deep sense of sadness and shame. But think of the vast majority of dedicated and generous priests and religious whose only wish is to serve and do good! …At difficult moments in the Church's life, the pursuit of holiness becomes even more urgent." "May Mary help us to welcome within ourselves the grace emanating from these mysteries, so that through us we can "water" society, beginning with our daily relationships, and purifying them from so many negative forces, thus opening them to the newness of God. The Rosary, when it is prayed in an authentic way, not mechanical and superficial but profoundly, it brings, in fact, peace and reconciliation. It contains within itself the healing power of the Most Holy Name of Jesus, invoked with faith and love at the centre of each 'Hail Mary'." I promise that when I pray the rosary each day, I will remember you and remember the Church in Canada with deep gratitude, affection and joy.